Well Saturdays don’t get much better than the last one, our junior teams were involved in 5 games and all ended with victories for the Owls. Unless anyone has been asleep or their internet has been down you should already know that we had 3 teams in SHGCL Cup Final action with all three (U14’s, U15’s & U18’s) lifting the Cup!!! Away from the cup our U12’s rounded off a very busy few days having played 3 league games (Wed, Thurs & Saturday) and coming away with two out of three victories. The latest win was a 3-1 victory over Worksop Town after our girls led 2-0 at the break. Scorers were Tamsin Stephenson, Talitha Diamba Miswa & Ella Shaw. Victory in their last game next Saturday will see our girls finish very creditable league runners up. Our U16’s also recorded a 3-1 away win away at Wisewood. A great result which although not affecting the team’s runners up position will keep 3rd place Sheff Utd 9 points behind our girls with us still having a game to play. Reports and photographs from Saturdays Cup finals will follow but I would just to like to re-iterate how well the 3 teams that represented the club did on Saturday. 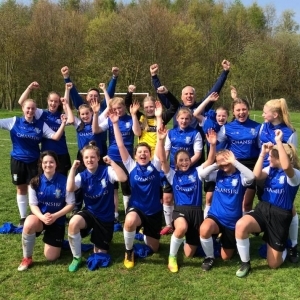 The U14’s had a tough game against Doncaster Belles who had just seven days earlier beat our girls 3-2, this times the roles were reversed and it was the Owls who came out on top with a 2-0 victory and lifted the trophy. Next up was the U15’s who were defending their hold on the cup which they also won last season. The girls faced a strong Sheffield Fc team but soared into a 3 goal lead before Sheffield pulled back 2 goals in the second half. Our girls had two more goals chalked off for offside but scored a final goal to clinch the 4-2 victory. Last but not least, our U18’s faced Chesterfield in their final and again lifted the trophy after scoring four times without reply after leading 1-0 at the break. Well done everyone on a fantastic day’s results and sending a lot of people home very proud after watching 3 out of 4 finals all involving successful Sheffield Wednesday teams.